Isaiah 6:1-13 Isaiah encounters God in the Temple and answers God’s call. 1 Corinthians 15:1-11 Paul met the risen Jesus & was called to be an Apostle. Luke 5:1-11 Jesus demonstrates his power, then calls Simon to follow him. 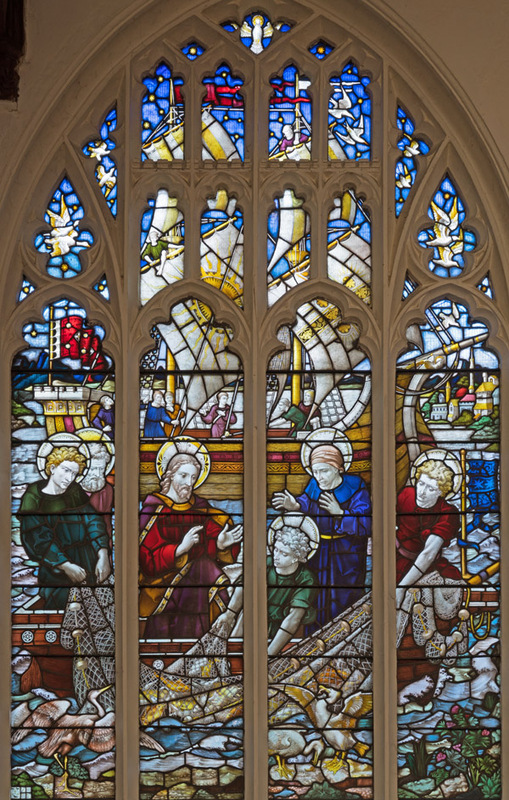 Miraculous catch of fish, by Clayton & Bell, in St. Neot’s parish church. The disciples’ faces are shown with looks of concentration and bewilderment as they deal with what’s happening, but struggle to believe it. Do we expect to see God acting in extraordinary ways? How would we respond in their place? • God’s call to Isaiah takes an unexpected twist: Isaiah is sent to proclaim a message to people who he knows in advance will ignore it. Many prophets experience this, but they are still commanded to speak (see Ezekiel 33:1-9). • Paul calls himself the least of the apostles – aware, like Peter, of his own sinfulness (see Romans 7:21-23) – but he claims the title as given by Christ. • Peter’s initial reaction to Jesus’ miracle is to want Jesus to go away: Peter is made painfully aware of his own sinfulness and inadequacy. • Jesus called some, like Peter, to follow him. Others followed without being asked (see Matthew 20:20-34). Still others he asked not to follow but rather to go elsewhere and tell people about him (see Luke 8:37b-39). Acts 9:1-8 The story of Paul’s conversion. A conversion and call this dramatic are very rare, but it shows that nobody is beyond God’s reach or care. Jeremiah 1:4-10 Unlike Isaiah’s eagerness, Jeremiah is reluctant to accept God’s call. Enthusiasm is not among God’s requirements for the role – most clearly seen in the story of Jonah – but faithfulness and perseverance are. John 21:1-16 Another miraculous catch of fish, this time after Jesus rose from the dead. Jesus renews his call to Peter after Peter’s denial of him. What other Bible passages come to mind when you read today’s readings? • Give thanks for signs of spring – snowdrops, daffodils and gradually lighter mornings. Thank God for showing faithfulness in the changing seasons. • Pray for the people and government of Venezuela: for wisdom, peace, freedom from malign outside interference, and a quick return to stability. • Continue to pray for the deliberations and decisions of the House of Commons over the future of the UK’s relationship with the rest of the EU. • Think carefully how God might be calling you to serve: where you are now, or somewhere new. Have that conversation with someone you trust. • Church electoral rolls are being completely renewed this year: remember to fill in a form if you wish to be included on your church’s roll.